Dark Red Juice, extracted from the Spills-On-Your-White-Carpet Fruit. Let’s come right out and say it: this bad little boy is an obvious clone of the Zebra Sarasa Push Clip. 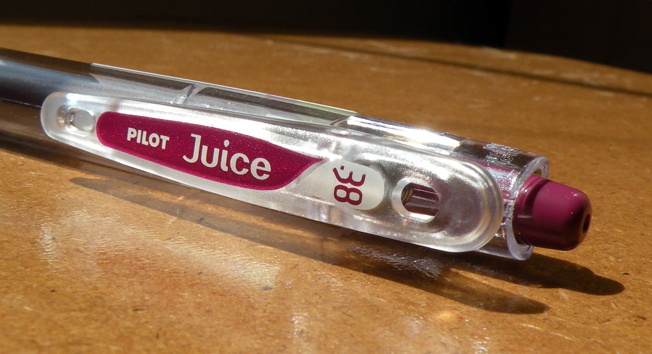 I don’t know which came first in Japan, but JetPens only recently began carrying the Pilot Juice so I assume it’s the derivative model. But perhaps ‘derivative’ isn’t the right word, because derivative sounds negative, and this pen is a definite positive. I love the design. It’s covered in little touches—the dots on the translucent grip, the gentle wave of the plastic around the knock, even the design-conscious label printed on the clip (a clip which has TWO holes, one for lanyards and one for charms, or heck, double lanyards! double charms! go nuts!). I wonder if they sell pens from vending machines in Japan. The answer should be ABSOLUTELY OF COURSE AND HERE IS YOUR FREE ROUND TRIP PLANE TICKET TO JAPAN TO GO SEE SUCH A VENDING MACHINE! It just looks good. Not dollar-dropping, work-of-art writing utensil good, don’t be silly. But it’s darn satisfying. 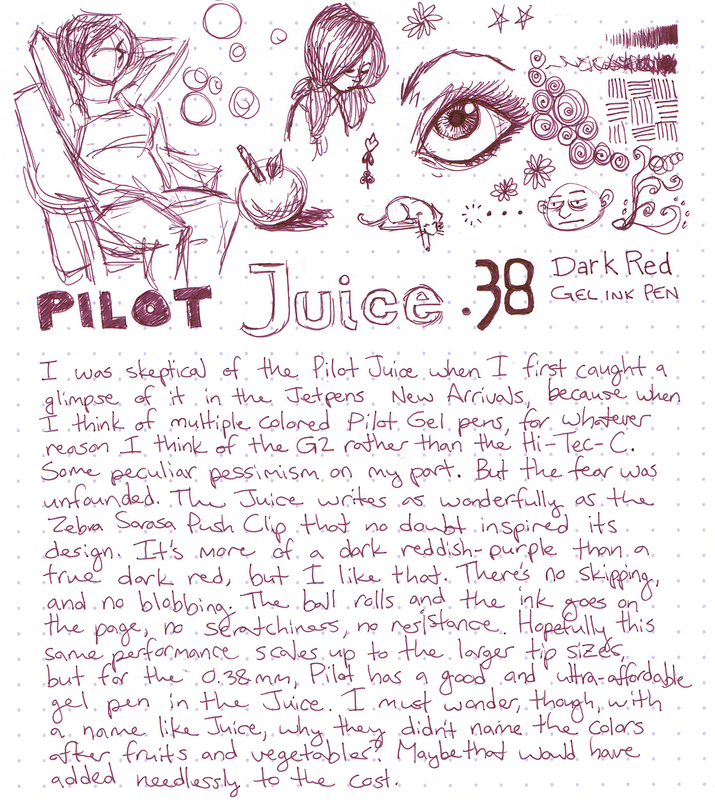 Pilot, tell your people that designed the Juice “good job” and give ’em gold stars all around. It looks like it should open more. Believe me, it won’t. I don’t think the clip capacity is as great as the Zebra Sarasa Push Clip, but I’m not too worried. I’m not looking for a binder clip with a pen attached. No blobs here. Lookin’ at you, Uni Signo DX Bordeaux-Black. I still remember your blobbery. When Pilot can make a gel pen that writes as nicely as the Juice, as attractive as the Juice, why do they even bother with the unreliable ogre that is the G2? It boggles the mind. The Juice performs well, laying down sharp lines without skipping or blobbing, and isn’t scratchy, provided you don’t write with a hammerhand (but then, no pen writes smoothly when you’re trying to bore a hole in the table through your paper). 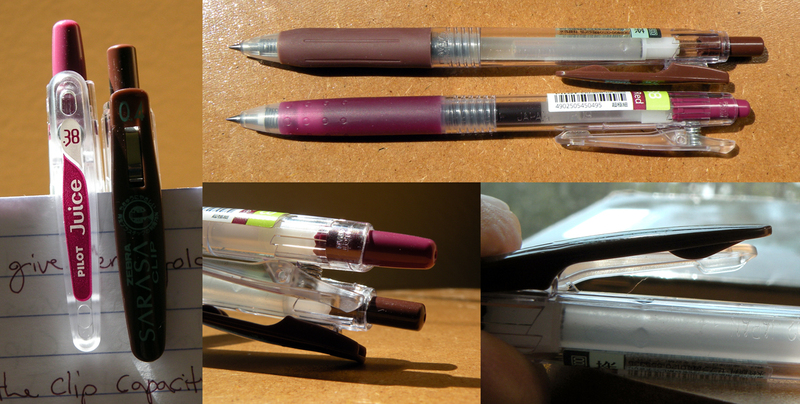 It comes in a bevy of colors, 0.38mm and 0.5mm tip sizes, and is technically refillable (though I don’t see any refills currently for sale at JetPens, the pen opens and the ink cartridge does come out). DARE TO COMPARE! DOUBLE DOG DARE! The closest comparable tip size for the Zebra Sarasa Push Clip is probably the 0.4mm. A brief run-down of the differences, besides being 0.4mm vs. 0.38mm: the Zebra barrel is a few millimeters thicker, the Juice, a few millimeters taller. The Zebra clip appears to be a type of hinge and opens wider than the Juice, which relies on a coiled spring in its clip. When clipped onto something, the Juice sits higher. How does the writing compare? Honestly? Switching from one to the other, they’re practically twins. But the Juice costs less. SCORE. Life would be better if I were an octopus and if all these wonderful pens worked underwater so I could write with more than 1 or 2 pens at a time. The world is just full of fine pens! For a look at the 0.5mm model, I recommend you check out The Pen Addict’s write up. He’s also got the link to the Japanese marketing site for the Juice, which is…something very special indeed. Just like the pen. I just started using the Juice pens. I have had some trouble with one of the purples (I have them all) and point blob, but it might just be that one particular pen. Mostly I love them and use them as much as my fountain pens, which is a lot since I send about 40 pieces of mail a week. I don’t have the Dark Red, but, because of your review, I will in my next order! Thank you! 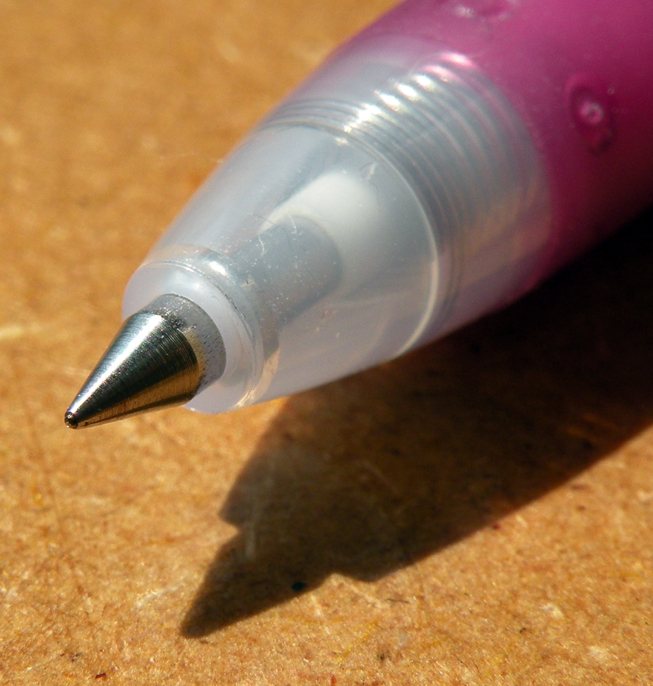 Quality control is often a gamble on cheaper pens, especially when you aren’t able to try them in the store. I wonder if anyone else has had blobproblems with that same color? I have several Pilot Juice pens and I love them. I want one (or three) in every color. They should do a special boxed set of every color in a container resembling a juice cup. I was in Japan recently, and no, I didn’t come across any of the aforementioned vending machines. 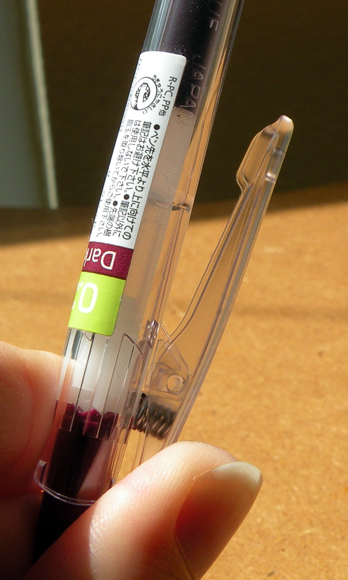 I did however see Pilot Juice pens in 0.7 mm. I will keep dreaming of a pen-vending machine! And glad to hear the Juice comes in 0.7!